Of the many Japanese winter soup recipes, this Bok Choy Milk Soup is my favorite. It is easy to cook, healthy, and delicious!! I believe this is “The Winter Soup”! Bok choy was brought to Japan from China around the 1970’s. The season for picking Bok Choy is early winter. So now is a great time to get delicious Bok Choy in many grocery stores in Japan and the US. Bok Choy has great nutrition such as beta-carotene, vitamin C, potassium, calcium and so on. When we think about nutrition, we shouldn’t cook Bok Choy too long, but my mother always cooked this soup until the Bok Choy would get tender because it is easy for kids to eat. So many of my friends also loved my mother’s “Bok Choy Milk Soup”. I used unsweetened soy milk in this recipe but you can use any kind of milk. And also I used turkey bacon but you can use regular bacon. I suggest you to taste and adjust the seasoning before serving if you use ingredients that are different from my recipe. Categories: soup | Tags: bacon, beta-carotene, bok choy, Calcium, Delicious, Digestion, Easy, Healthy, Homemade, milk, potassium, recipe, soy milk, Vitamin C | Permalink. This is a very easy and tasty traditional side dish. Mainly we eat it in the summer time because it is cold and contains pickled plum. 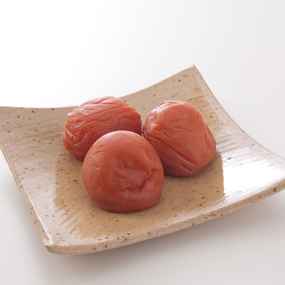 Pickled plum (Umeboshi) is a Japanese traditional healthy food. The recipe for pickled plum is to salt fresh plums and then dry them under the sun. Pickled plum has protein, calcium, iron, vitamins and so on. We eat it very often, but especially when we feel tired, we have a sore throat, and most importantly when we want to prevent heat stroke while outside in summer time. Pickled plum also has antibacterial effect so we sometimes put it on rice in our lunch box to keep the rice from going bad. This plum sauce contains sesame seeds so it is a very nutritious and flavorful sauce. You can use this sauce for other meat or fish dishes. And if you add olive oil to the sauce, you can use it as a dressing for your salads. Chicken tenderloin has great taste and nutrition. It doesn’t take much time to cook but if you over cook it, the meat will be hard. In this recipe, I show how to get tender chicken tenderloin. 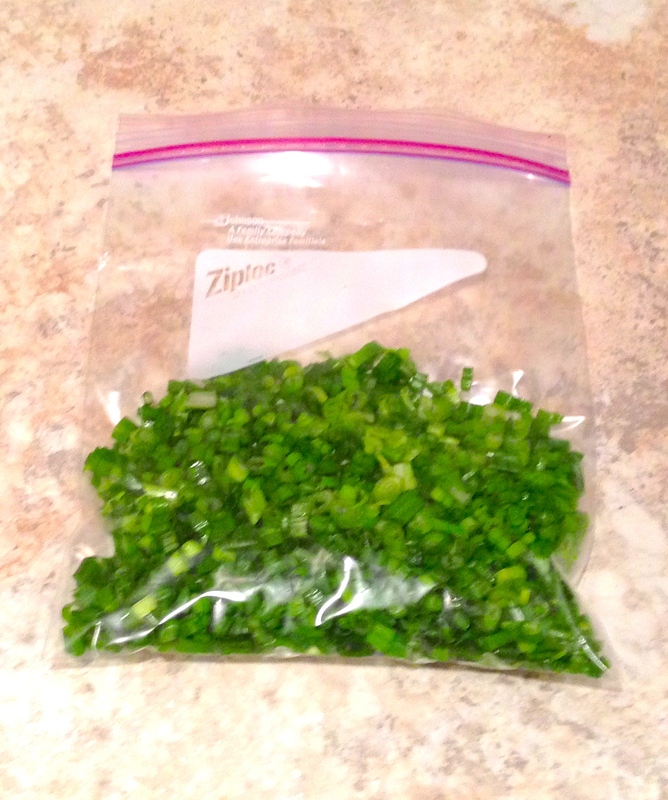 If you use this method, you can always get good tender chicken for any of your dishes. Enjoy this divine chicken dish!! Categories: Chicken, side dish | Tags: Calcium, Chicken, Chicken tenderloin, Delicious, Easy, gluten free, Healthy, Homemade, iron, Japan, Nutrition, pickled plum, plum sauce, protein, Quick, recipe, Sesame, tender, Vitamins | Permalink. 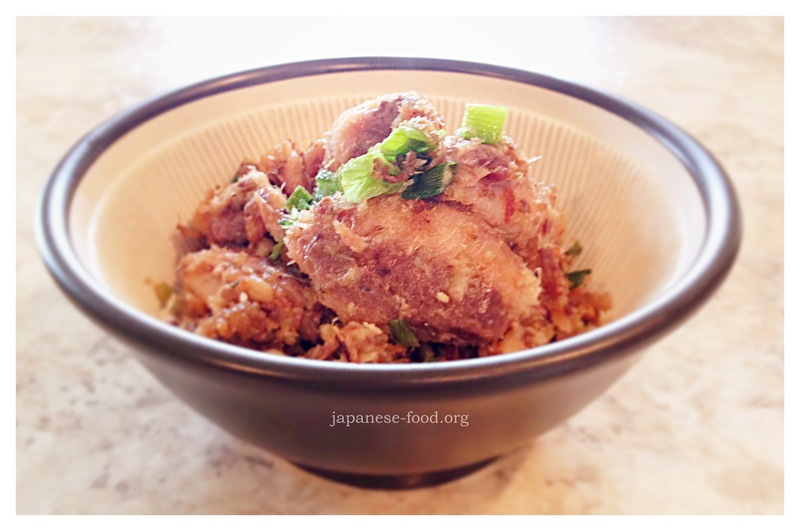 This recipe is just grated Japanese yam. Japanese sometimes eat grated yam by itself, pour it on steamed rice, or put it on noodles, and so on. 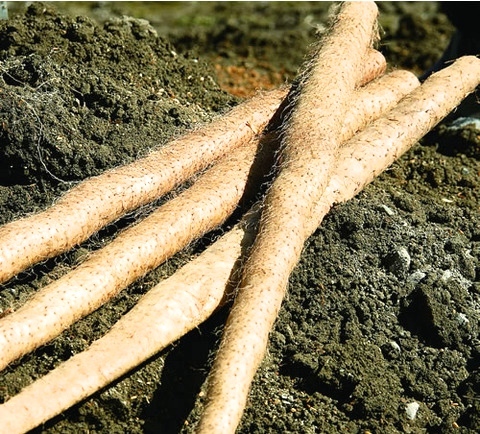 The yam has a sticky texture because of Mucin, one of it’s ingredients. Especially when the yam is grated, the texture become more smooth and sticky, and this sticky texture gives our bodies some great benefits, such as protecting our mucous membranes in the stomach, protecting our body from some viruses and so on. Mucin is a soluble fiber and helps keep water in our cells. Traditionally, people say the grated Japanese yam loosened phlegm, so I used to eat it when I caught a cough. Additionally, the yam is easy to digest so it is good food when you are sick. It is easy, simple and quick. Nothing difficult. Just grate the yam and mix with some Japanese Dashi stock. Categories: side dish | Tags: Calcium, Calcium oxalate, diastase, Digestion, digestive enzyme, Easy, gelatinized starch, gluten free, Healthy, Homemade, Japan, Japanese Yam, mucin, Nutrition, potassium, recipe, simple, soluble fiber, Traditional, vegan, Vegetable, Vegetarian, vitamin B1, Vitamin C | Permalink. Have you ever had Japanese yam? It is a kind of potato that grows straight into the ground so it has a long shape. (It sometimes grows to more than 3 feet). 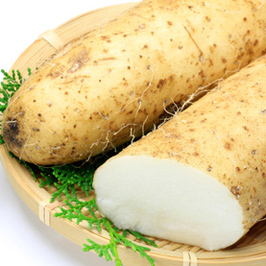 In Japan, people have eaten the yam for about 3000 years. 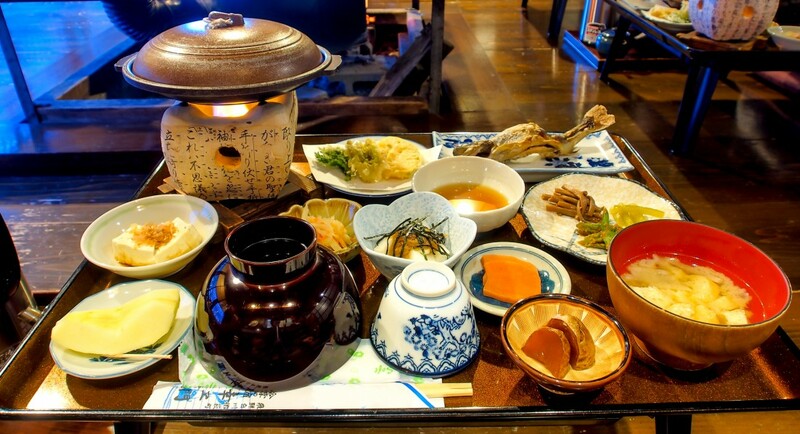 Therefore, the yam is very important to the Japanese diet. We can eat this yam raw because it has a gelatinized starch and some of the nutrition in this type of yam are breaks under heat. The Japanese yam is rich in diastase, a digestive enzyme which helps our digestion and absorption of nutrition into the body. Also the yam is high in vitamin B1, vitamin C, calcium, potassium and mucin. Mucin is soluble fiber and helps keep water in our cells. Therefore, it protects our mucous membranesin the stomach, and protects our body from some viruses. Some studies say the yam also prevents dry eyes because mucin is an ingredient in tears. Mucin gives the yam a great smooth, sticky texture, especially when it is grated. This is great for our body. It heals our tiredness and helps our digestion, so the yam is great for your diet when you are recovering from being sick, when you have no appetite, and so on. Today, I introduce you to Japanese yam salad. It is very simple and easy. I always use pickled plum sauce because it is extremely healthy and is a fermented food. But you can use any dressing you want, because the yam doesn’t have strong flavor so it won’t change the taste of your favorite dressing taste! Enjoy your new nutritious salad!!! Categories: Salad, side dish | Tags: Calcium, Calcium oxalate, cucumber, diastase, Digestion, digestive enzyme, Easy, fermented, gelatinized starch, gluten free, Healthy, Homemade, Japan, Japanese Yam, mucin, Nutrition, pickled plum, potassium, recipe, simple, soluble fiber, Traditional, vegan, Vegetable, Vegetarian, vitamin B1, Vitamin C | Permalink.